Arlene Foster said she was “delighted” an arrangement had been agreed. The Prime Minister said the DUP and the Tories “share many values” and the agreement was “a very good one”. That’s an understatement. You can read a full account of how devolution is supposed to work here. Carwyn Jones, the Labour Welsh first minister, has stated unequivocally that the DUP deal “all but kills the idea of fair funding for the nations and regions”. Kezia Dugdale issued a statement saying: The deal makes David Mundell’s position completely untenable. The problem is, it always was. But it also points to the ways in which Brexit and the Coalition of Chaos is undermining the Precious Union and Devolution itself is under attack. The basis of the devolution settlement is unfolding. The Barnett Formula has now gone the way of the Sewell Convention and Fixed Term Parliaments. Arlene Foster said: “We’re delighted that we have reached this agreement, which I think works, obviously, for national stability. In terms of the Northern Ireland executive, of course we are determined to see it back in place as soon as possible as well, because we believe we need a strong voice for Northern Ireland when dealing not least with the Brexit issue.” The idea of “the nation” – and “national stability” is a questionable one. Colonel Ruth has issued a statement, trying to re-frame the funding as akin to ‘city deals’: This is some stretch. As Kirsty Blackman has put it: “The DUP deal cannot be described as “like city deals” as funding is NOT targeted at cities/regions.” The funding is to national projects like broadband, health care improvements, infrastructure developments. You can read the full detail here. This is American style pork-barrel politics. The devolution settlement, and the entire creaking and groaning ship of state that is the decrepit UK is held together by the skin of the teeth. It’s dependent on a degree of trust, good faith and transparency and all are greatly eroded by this farce. The effect of this scrabble for money is also to demean and undermine the devolved governments. 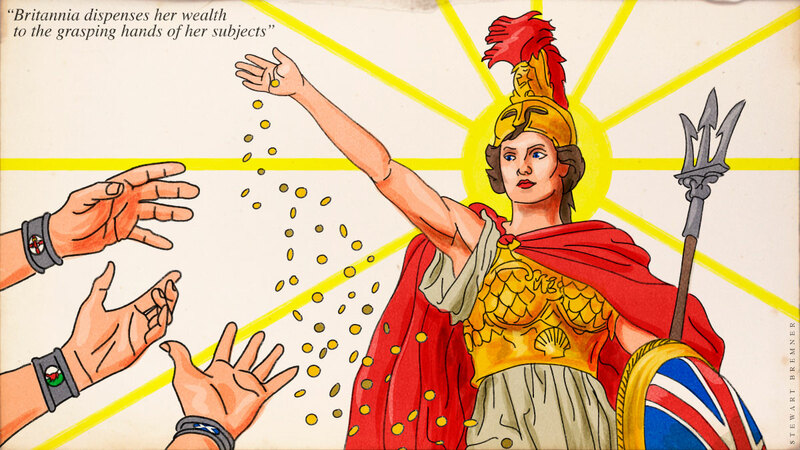 It adds to the picture of a benevolent central authority doling out lolly to the outstretched and impoverished regions. This is probably about the time where commentators pop-up and explain that the “partnership of equals” phrase was either a) never really used b) never really meant or c) not really very important. Britain is cracked. Let the light in. As Mr Jones says, it’s a bung, to keep the Tories in power, and we are all paying for it. Maybe Mexico paying to build a wall isn’t so outrageous after all. If Scotland’s new Tory MPs fail to extract the same deal for Scotland in return for supporting May’s government then we must conclude that they do not have Scotland’s interests at heart. It will be hard not to conclude that they have been elected to represent the interests of Westminster’s Tory government alone. I hope the fishermen and farmers of NE Scotland take note. I’m sure Mayhem and Colonel Ruth will do the right thing for Scotland and produce extra funding in proportion to our population. Therefore, no need for the genius that is Kezia to say anything. I’m not sure if I’m right, but isn’t the Stormont Executive suspended just now? So who is going to receive and spend this billion pound bribe? There’s more smoke and mirrors going on here. 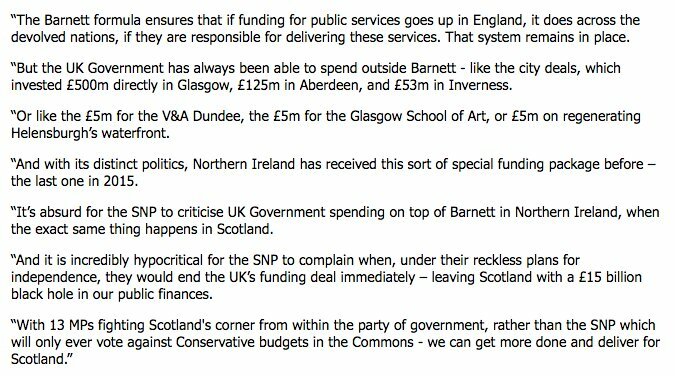 This has to be outside Barnett formula otherwise the Tories would have to hand over real dosh to Labour in Wales and the SNP in Scotland. But as Stormont is suspended are they really handing over anything to anyone? Maybe if they resurrect direct rule from London,they can claim UK expenditure so no Barnett consequentials. However given the Tory arrogance,they just make the rules up as they go along,and get away with it. “and get away with it”. Tragically they will, because the majority of scots will let them. the cash bung certainly will encourage the NI politicians to get together and patch up a new deal at Stormont…nothing like giving them money to spend. And here’s the thing. We don’t really know if Labour or the SNP has a strategic answer to this. The Tories’ calculus is that their voters, and prospective voters are far too thick to care how their bribe-based offering stacks up against Corbyn’s Keynesian arguments, or ScotNat’s concerns for a transparent and fair regionalism. And the Tories are probably right. They would see it as an application of Public Choice Theory. Treat society as a collection of selfish actors. Divide, then conquer. To the Tories and their backwards constituency /all/ public spending is just a bribe, albeit it more or less deserved depending on who you are. What no-one is acknowledging about the “miracle” of Corbynism is that the Tories /screwed the election/ down South by abandoning exactly this strategy vis a vis their traditional pensioner voters. Nick Timothy’s out-of-touch and pretentious experimental manifesto imperiled the “triple lock”. (And that’s why Timothy was scapegoated so quickly). In spite of the left’s haranguing, the DUP have actually done astonishingly little via arm-twisting which the Tories /didn’t already know they had to do themselves/. Why should this be a surprise given the DUP’s insignificance and their core ideological belief in British state power? The anti-politics heuristic of “just bash the Tories as hard as possible” constantly misses this kind of nuance. Pensioners will return in droves to the Tories and, it’s very likely some more bribes will be forthcoming to place Tank Butch in a flattering light so they can bank those lumpen Scottish votes too. “Equal partners in the union”, and all that pish. Unless the left and nationalists as a whole finally focus on articulating and analysing the big picture reality of working class self-interest they will lose. That big picture of course is Brexit as a neoliberal plot to create a laissez faire economy. Directly antithetical to a Keynesian style economic program. Yet we now know Corbyn can’t even articulate a coherent policy on Brexit, and yet somehow we all think it’s “responsible” for Sturgeon to be winding her neck in on the 2019 referendum. The one insurance policy Scotland is supposed to have. The uncomfortable reality is we are all a lot closer to thinking like Tories – deferential, conservative and small minded – than we realize. Pensioners never left the Tories. The Tories increased their vote. It’s just that Labour increased theirs more. Young people came out and voted. Whether this will continue remains to be seen. I wonder if “fluffy Mundell ” will be grilled by Brewer on the Sunday Politics show, doubt the BBC will go there! So power sharing in Northern Ireland ended due to the DUP mishanding and consequent scandal that surrounded a “fuel” policy – circa £500 000 000 wasted. Sinn Fein refused to contine to work with Mrs Foster who ws involved in the scandal until an independent inquiry clears her and asked she stands down for the period of the inquiriy. So the tories are signing deals with people about everyone’s future who others do not trust and who refuse to take responsibility for squandering £500 000 000. No wonder Mrs May looked a bit peely wally at the signing of the deal. Welcome to the uk in 2017, you could not make this stuff up! I think if the Tories are so intent on bribing the DUP then it should be paid for out of Tory Party funds and not with taxpayers money. It is obvious that Theresa May had a plan A, to win a thumping majority and pursue a hard Brexit, rolling back citizens’ rights with Davis’s Great Reform Bill. Having lost her majority, and her authority, she now has to cast around for a Plan B. But even that wouldn’t work without a special deal with Arlene Foster, the barn-roasting leader of the DUP. In some ways, you could say the Tory-DUP deal is Plan B Special…. scary stuff, particularly for anyone of liberal sensitivities who believes in civil rights. The DUP really don’t. We are still waiting for the other shoe to fall. What other shoe? The assumption that is consistently, persistently made that the Barnett formula – as a matter of form and process – operates automatically and operates in all cases of public policy and public spending. Why is that assumption made by, well just about everyone; from politicians, through the media, to the public? It is assumed to be true because if it is false, a whole can of worms in the funding of British public policy opens to view. I doubt if it is true or has ever been true, but I do not pretend to have a definitive answer. Is it true; that is the question? We know that there are exceptions to the Barnett Formula arrangements; typically referred to in generalised terms of the ‘national interest’ (e.g., defence and security), but without any thorough, detailed examination of the facts; the specific policy and spending details, issue by issue, item by item, and the mechanisms for the decision-making ever being revealed or explored. There may be many other kinds of exception. We should not be seduced into accepting generalised waffle from Government about the ‘national interest’ but rather demand the facts; clear, ‘concrete’, specific, comprehensive illustrations of how Barnett has actually worked, or been avoided or excluded. Here is the question that should be asked. 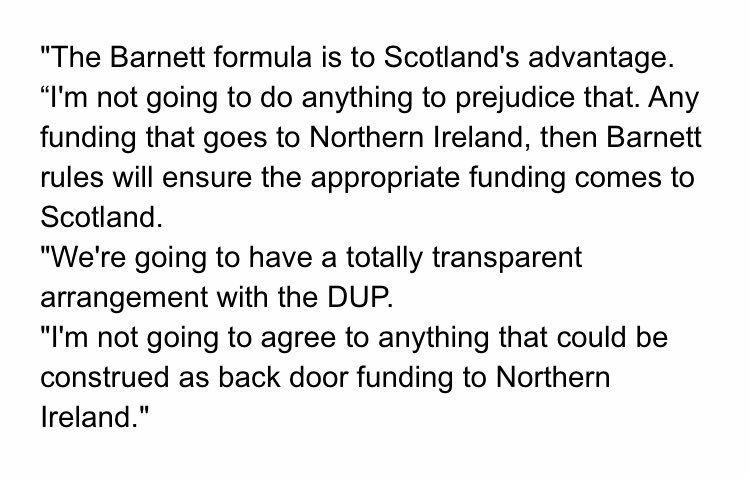 Beyond the DUP agreement, over the last ten years (merely a starting point) what specific funding decisions have been made by the British Government, for whatever reason, that have been decoupled from the Barnett Formula process, or have been excluded (ex-ante or ex-post) as a matter of policy, in whole or in part, or in any other way, from Barnett Formula consideration? The wording here is rough and merely illustrative; but the question must be comprehensive because, to be candid, if Government can hide the facts on a technicality of interpretation, or an ambiguity of meaning; assume that it will hide the facts. This question, carefully framed, should be made as a Freedom of Information request. These power games are desperate and without honour. It seems to me that we’ve not experienced such dishonourable action by government since the industrial farce in the 1970s. No easy answers! We Scots must shake off our caution, use all our muscle, and secure independence. There’ll still be no easy answers to the challenges of government, but they would be our answers. They wouldn’t be complicated by vested (capitalist) interests and the establishment.